Updated 8/16/16 with the 2017 Charger Daytona available in yellow around October. Also added in the BRZ Series.Yellow, MB Sprinter, and Nissan bringing back yellow on the 370Z for MY17. Now I need to re-do the collage when I can find a minute! Good morning Oppo! I’ve been hanging around here for a long time lurking, then commenting and finally posting. Thanks to the mods (DasVWauto) for giving me authorship! For my first post, I wanted to write about something I care way more about than most sane people: yellow cars. Wow, many FD. Much Competition Yellow Mica. The vast majority of cars I see on my daily commute are various shades of gray with an occasional brick red or dark blue thrown in. When I see a bright car in the mix, it makes me smile. Bright greens, oranges, reds, and the elusive Polestar blue can really grab your attention in a sea of boringness. Yellow, however, is my personal favorite. I may be biased, because I used to own a bright yellow S10, but it does have the best resale value. 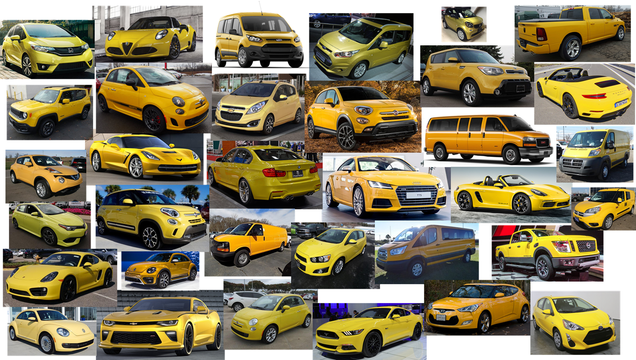 Unfortunately, since nobody buys yellow cars in the USA, there aren’t that many cars that come in yellow right now. So in the spirit of previous posts like every manual available in the USA today, this is my attempt to help the cause and let you know what is available in yellow so you can go buy one and save the yellow cars! One ground rule - I’m looking at “mainstream” cars here, so there is a base price cap of $100,000. Once you get above that you can probably request any color you want. Nope. Not even the NSX. No yellow for the coupe or Giulia sadly. The R10 is also available in Vegas Yellow, but it doesn’t fit under the $100k cap. None, sadly not even the V models. Spark - Chevy calls this Lemonade so I’m including it, though it barely counts. They still sell this, but the new 2017 model will not have a yellow option to start. The Colorado used to be available in yellow last year, but that option has been replaced with orange for 2016. Nothing this year unless you custom-order it on a Viper. Dodge has been pretty good in the recent past with special edition Chargers and Challengers and even that weird neon yellow Dart, so hopefully they bring back yellow to more models soon. Update 8/16/16: The Charger Daytona is back in yellow for 2017! All versions of the 500 are available in some form of yellow. I’m on the fence about the Tangerine Scream FoST and Electric Spice Fiesta/Edge/Escape, but I’m going to count them as orange and exclude them. It may also be possible to order an F250/350 in yellow through fleet sales. No, and I don’t think there has ever been a factory yellow from Infiniti. Surprisingly, there is no yellow Wrangler at the moment. Nothing right now. There was a special edition yellow Evoque a few years ago, but it is gone. No, but Molten Orange on the GS-F and RC-F shows they are getting closer. Nothing until you get to the GranTurismo, which is above our $100k cap, which is sad - all Italian cars should have a yellow option (see: Fiat 500). There were rumors that the new Miata would be available in Sunflower Yellow, but that didn’t happen. So no yellow Mazdas for now. Nothing under $100k in the USA. dodisabob has informed me that the Sprinter Van can be ordered in yellow - Calcite Yellow Metallic to be precise! I have never seen one in anything other than white or gray in person. Not right now, although Volcano Orange is close. Another company that has embraced orange rather than yellow. Update 8/16/16: The 370Z is available in Chicane Yellow again for MY17 after a hiatus. I think they might be the same paint as the juke under a different name. Lots of yellow here, primarily for commercial customers. 1500: Stinger Yellow (Special Edition Package)... there is also a “Yellow Rose of Texas” edition coming soon. There was a Sunrise Yellow limited edition Crosstrek last year, but it is gone. Now we get a limited “Series.Yellow” BRZ. I’m in love with this thing. I’ve already been thinking about a BRZ when the Forester is paid off and this really ticks all the boxes. Sadly as a limited edition Subaru the used ones will probably sell for more than the new ones for the next 5 years. I don’t think there has been a yellow Volvo sold in the USA since the 850R back in 1997. Europe got a yellow C30 for a while. And that’s it! What surprised me about this list is that it isn’t concentrated solely on sports cars and pickups. There are economy cars and CUV’s mixed in with prices ranging from $15,000 all the way up to as much as you care to spend. There’s even a weird little exclusively-hybrid Prius C in there. Unfortunately some of these options will go away next year, but hopefully something like a Challenger or MX-5 will offer yellow to fill the void. What did I miss? Also, feel free to show off your yellow cars in the comments - more yellow cars make the roads a better place!